Sathya Sai Sath Sambhashana is a book compiled by Sri Sathya Sai Baba in his own Telugu handwriting. Some time beofre taking leave of his body, Sathya Sai Baba called Sri Sravan Kumar Wupendrum to Yajur Mandir (where Baba resided) and gave the handwritten book to Sravan Kumar. 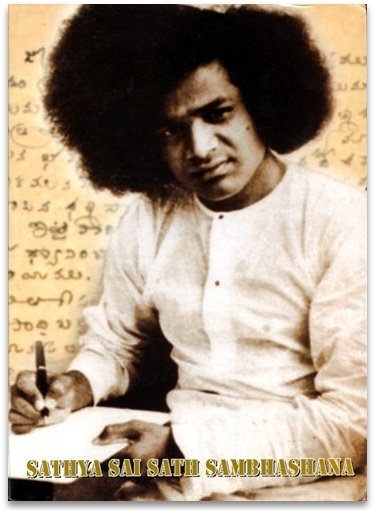 The book is scans of the Telugu original handwriting by Sathya Sai Baba. Opposite each scan (we cannot provide a facsimile copy due copyright law) is the translation to English of the text on that page. There is a Foreword by Sri Chakravathy, who served as Ashram Secretary for many years. Sravan Kumar, in his introduction tells of how he came by the book and the instructions given by Sathya Sai Baba about printing, translation and making this available to devotees, worldwide. It is difficult to review something that the Supreme Paramatman has written itself in the form of Sathya Sai Baba. Baba has written the Vahini series of teachings, and for year upon year, given divine discourse and teachings to all and sundry who would stop to listen, reflect and practice. So a book to read slowly and to reflect upon. Copiously illustrated, on high quality clay coated paper. 124pp. The prescription by the Divine Doctor: Take one page, read daily. Confined to the pain of externals!